Nearly 20 years ago, I took a trip to Charleston, South Carolina. I was quite taken by the stately, historic homes, tucked sideways to the street and blanketed by lush, secret gardens. The marketplace was a plethora of sights, scents and sounds – local artisans weaving sweet grass baskets, aromas of intricate spice blends, and faint lingering chords of street musicians. 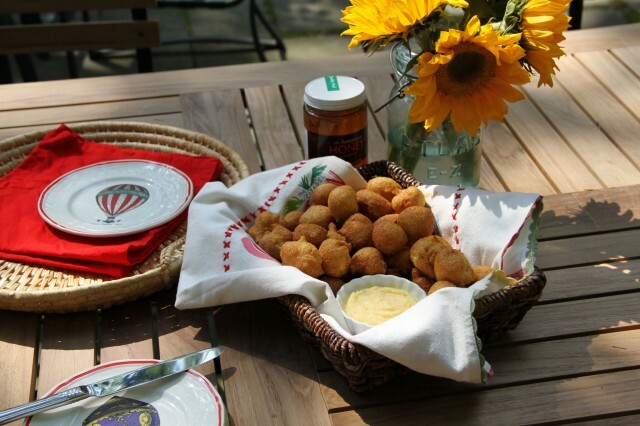 But most of all, I was entranced by the deep-fried mini-cornmeal cakes playfully called hush puppies. And at every restaurant we visited, I was rewarded with a steaming basket of these little babies before even seeing a menu. Last month, I returned to Charleston, and was disappointed with the evident lack of hush puppies. When I inquired where they had gone, I was reminded that Charleston is now THE food destination in the US, and weren’t hush puppies just a tad passé? 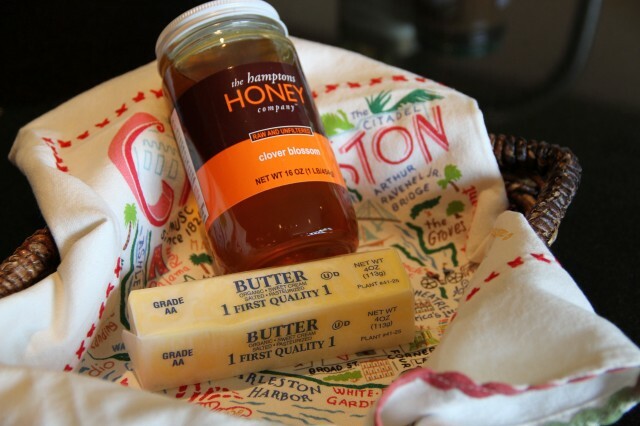 Upon returning home, I decided to make my house THE food destination for breakfast in bed, starting with a basketful of hot, crisped hush puppies and a side of homemade honey butter. Yumm. Pour oil at least 2 inches deep into a small, heavy pan. Heat over medium heat to approximately 360°. In a large bowl, combine corn meal, baking powder, sugar and salt, stirring to mix. Add milk, cider vinegar and egg and mix well. Batter should be slightly thicker than pancake batter. Use a teaspoon to measure batter. 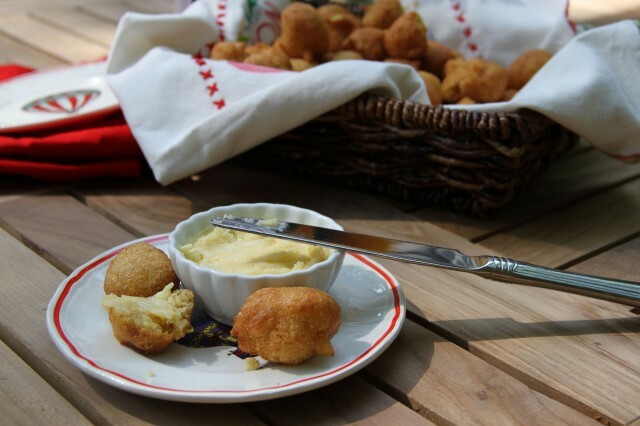 Carefully drop a teaspoon of batter into the hot oil for each hush puppy. Dip spoon into clean water after each hush puppy. This helps the batter to drop off the spoon easily. Cook about eight to ten hush puppies at a time, allowing oil to retain its temperature. 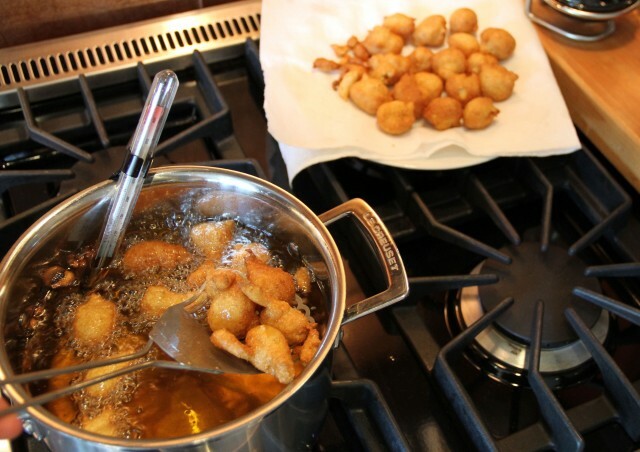 Fry the hush puppies until they have reached a deep golden brown color, about 2 to 3 minutes. They tend to flip over on their own, but give them a little push with a spoon if they don’t so they cook evenly. Remove hush puppies from pan and drain on paper towels. Serve hot with honey butter. 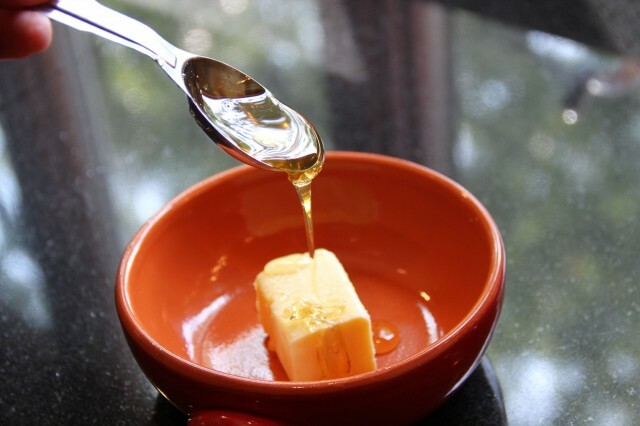 Add softened butter to small bowl. Stir in honey and mix well. Refrigerate until ready to serve.